MORE KIDS THAN SUITCASES: Stop Watching Cartoons And Get Out Of The Shower!! Stop Watching Cartoons And Get Out Of The Shower!! I woke up well before everyone else this morning, which meant that I got to do the breakfast run. A twitter friend had recommended to me that I try the white chocolate scones at Giovane, the cafe attached to the Fairmont Pacific, and when I asked the front desk agent where the cafe was, she recommended that I try the sugar buns. Sounds like the perfect breakfast to me, so down I went and picked up enough pastries for everybody. Apparently these two ladies have some sort of inside scoop on the Vancouver breakfast scene, as the scones were fantastic, and the bite of the sugar bun that I managed to get away from my wife was amazing. I now have a new "must have" item for breakfast in Vancouver, which I much prefer to my kids "must have" of McDonalds pancakes. There was a lesson to be learned today though. My kids are pretty good at getting up in the morning IF they have to. They've had enough practice at clearing out of hotel rooms for 6am flights that they know the morning drill, and things run pretty smoothly. This morning, however, things were running behind. The shower times were running long, and the morning wash-up was taking forever. I was really beginning to wonder what kind of illness was slowing our children down when my wife reminded me "You know there's a TV in there right?" I had totally forgotten, even though now in hindsight I can remember dawdling at the sink while I caught the sports highlights. I hadn't bothered to arrange a late checkout as I figured noon would be plenty late enough, but lunchtime was rapidly approaching and the only sound I could hear from the bathroom was that of channels flipping. I'm sure there was a button on the control panel that shut the TV off, but I couldn't figure it out so we did our best and I made a mental note to always request a late checkout if there's a TV in the bathroom mirror. When we finally got underway, we were headed for Whistler. I must say that for all we heard on the news, I thought the changes to the Sea to Sky highway would be more significant. I was anticipating some sort of fast moving four lane highway to be in place, but other than a little re-routing at the beginning, I didn't notice very much different. I did notice the road signs were new though. 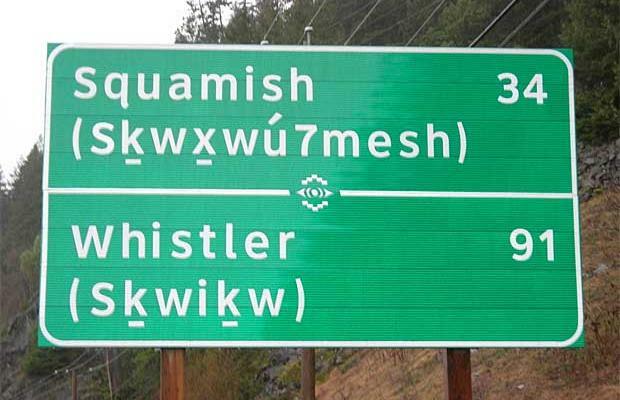 I need to find out what language they are using underneath the English on these signs, and more importantly I need to know how to pronounce the number 7 in Skwxwu7mesh. We're staying at the Fairmont Chateau Whistler tonight. After last night at the Pacific Rim, I had high hopes to be headed to another Fairmont. We pulled up to valet parking (still cheaper than self-park in Vancouver) and to my surprise the valet not only took the van and the bags, but he handed us the keys to our room and sent us straight up. Sounds wonderful right, but I had some concerns and it turns out they were warranted. Checking in at the front desk can involve a little bit of a wait, but it allows you to confirm everything such as your rate and room type, and sure enough when we got to the room we had been given the wrong level of room. It wasn't that big a deal, and after confirming that we had been placed wrongly, we decided to stay where we were. It seemed like it might not be proper to move since the kids had already started picking at the fruit plate that had been left for us. Still it was a little bit of a disappointment to have the valley view instead of the slopeside. There wasn't really a reason for coming to Whistler other than the fact none of our children had ever seen it, and Lori and I hadn't been here in over 13 years. They've made a couple of changes. Actually my memories of Whistler are a little fuzzy (Lori was nine months pregnant with the boy last time we were here, thus I was focused on other things.) so I doubt that I could detail everything that's different to you, but I'm pretty sure the Olympic stuff is all new and wasn't here in 1998. We had a fun time walking around the village, eating at the Old Spaghetti Factory, and watching some insane BMX riders race down the mountain. I do like the feel of Whistler, but as a non-outdoorsy type person I'm just never going to really be at home here. On the other hand my two ski-fiend kids would probably love a winter visit. So now we are all settled in the room for the night. I might be a little spoiled after staying at Pacific Rim last night, but the Chateau Whistler really isn't my style. It's a slightly older hotel, with a normal bathtub, regular light switches, the wrong view, and despite my remembering to request a late checkout tomorrow, there's no tv for me to watch in the bathroom.